What does Toronto’s new bike plan offer Scarborough? Over the past year, the City of Toronto initiated a citywide public consultation process on a new ten-year Cycling Network Plan. The staff plan, recently presented to Toronto’s Public Works and Infrastructure Committee, aims to expand and improve the cycling network and build much needed cycling infrastructure across the entire city, with 41 km of on-street bike lanes proposed for 2016 alone. In a previous post, I explained how small local investments in Scarborough’s cycling infrastructure could improve livability, safety, and prosperity, especially in communities with limited transportation options. This post examines Toronto’s proposed Cycling Network Plan and the potential impact that cycling investments could have in Scarborough. Starting in 2014, the City began collecting cycling route data using a free mobile app. This data was analyzed and used to develop the Cycling Network Plan. Then from April to June of this year, the City conducted a survey containing 24 questions, and collected over 10,500 responses. The City also gathered input from public drop-in events and also utilized an online mapping tool to help visualize a draft plan, which highlighted potential routes on ‘Proposed Major Corridors’, ‘Fast Busy Streets’, and ‘Quiet Streets’. Some highlights from the survey include; 88% of respondents stated that the cycling budget should be increased in order to quickly expand/upgrade the cycling network; protected bike lanes/cycle tracks are what the City should focus on; and the City should build bikeways that support the travel patterns preferred by commuter cyclists as opposed to off-street routes in parks and greenspaces. The survey results can be found here. The online mapping tool used by the City to capture feedback identified some major transportation corridors where the installation of cycling infrastructure would improve connectivity both within and beyond the core. Some of the major roads identified on the online mapping tool included Yonge St., Bloor St., Lake Shore Blvd., Danforth Ave., Kingston Rd., and Midland Ave. (N.B., The City’s online mapping tool is no longer accessible online.) Also of interest, in the 2016 Implementation Program of the Cycling Network Plan is a proposed bike lane pilot project on Bloor St. between Shaw Ave. and Avenue Rd. The installation of Bike lanes on the Bloor-Danforth corridor has been a long sought after goal of cycling advocates for decades and the topic of two separate research reports on the economic impact of bike lanes on Bloor St. published by TCAT (2009, 2010) and a third featuring Danforth Ave. produced by Ryerson (2014). The 2016 Implementation Program focuses on the immediate expansion of the on-street bikeway network in the downtown wards to try to meet the demand of a recent explosion of cyclists. Cycling infrastructure improvements in Scarborough will likely be included in the full ten-year plan due next spring, which will provide a longer-term implementation schedule. Future improvements in Scarborough particularly on Danforth Ave. and Kingston Rd. would greatly enhance east-west connectivity to other major roadways (i.e., Lawrence Ave. E., Eglinton Ave. E., St. Clair Ave. E., Danforth Ave. and Queen St. E.). As a long time Scarborough cyclist, I can attest that bike lanes on Kingston Rd. would improve transportation options for communities like Birch Cliff, Cliffside, Cliffcrest, Scarborough Village, and Kingston Galloway/Orton Park, some of which have seen only piecemeal cycling infrastructure investment over the past few decades. Currently, Kingston Rd. is serviced by a several TTC bus/streetcar routes (i.e., Routes 9, 12, 22, 69, 86, 102, 116, 198, 502, 503), none of which travel its entirety, and thus a contiguous bike lane on Kingston Rd. would provide a direct and safer option for cyclists to get downtown to connect to the Dundas St. E. bike lanes or the Waterfront Trail. 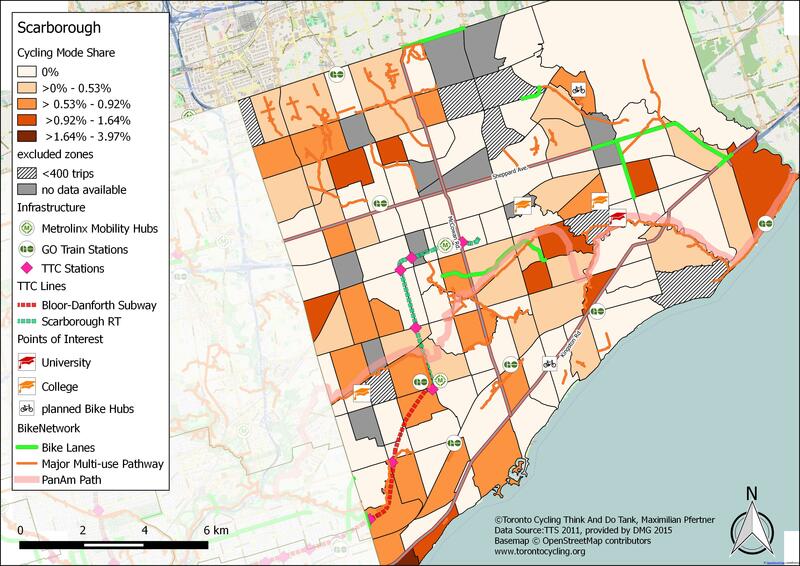 Research by the Toronto Cycling Think and Do Tank reveals that southwest Scarborough along Kingston Rd. has the highest levels of cycling mode share in all of Scarborough, and infrastructure investment here has potential to increase cyclists safety in these communities. It should be noted that much of Kingston Rd. is a wide six-lane roadway that includes a paved centre median, and thus it could potentially be reconfigured to include protected cycle tracks while maintaining the existing lanes. The corridor is also identified as an avenue in the Official Plan and thus designated for mid-rise development with the goal of creating neighbourhood destinations. Proposed bike lanes for Midland Ave. would also help address the limited number of cycle-friendly north-south connections in Scarborough where major infrastructural barriers include Eglinton Ave. E., Highway 401, Sheppard Ave. E., and Finch Ave. E. Bike lanes on Midland Ave. would also make important connections to the Gatineau Hydro Corridor Trail and would help leverage the improvements to Eglinton Ave. E. associated with the Eglinton Crosstown LRT. Key gaps in Scarborough’s cycling infrastructure were articulated throughout the City’s research phase of developing a new Cycling Network Plan. However, it looks like the only new bike project for Scarborough in 2016 is the extension of the Gatineau Hydro Corridor Trail eastwards to connect to the Conlins Rd. bike lane. Scarborough residents will need to rally together to ensure that proposed bike infrastructure improvements for Scarborough – like Kingston Rd. and Midland Ave. – are in the next phase of the plan.